Sao Tome e Principe stunned visitors Ethiopia with a 1-0 win in the first leg of their preliminary round qualifier for the 2018 World Cup. 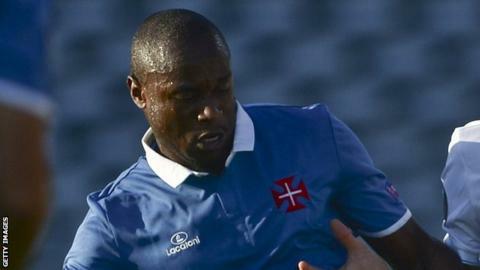 Luis Leal, who plays for Portuguese top-flight side Belenenses, scored the only goal of the game in the 87th minute for the team lying 193rd in the latest Fifa rankings. The second leg is due to be played in Addis Ababa on Sunday with the overall winners progressing to play Congo Brazzaville in the next round in November. In Thursday's other tie, Liberia and Guinea-Bissau drew 1-1 in Monrovia. The Lone Star's plan to attack their visitors looked to be working when one of their four attackers, William Jebor, scored from the penalty spot after 36 minutes. However the visitors scored a vital away goal in the 63rd minute through Malado Reld Anido, who headed home after the Liberian goalkeeper failed to deal with an easy long-range effort. The mistake ensured the first official meeting between the two nations ended in stalemate. It leaves the tie evenly poised going into next Tuesday's second leg in Bissau, with the aggregate winners set to face current Africa Cup of Nations holders Ivory Coast . Portuguese coach Paulo Torres is in charge of Guinea-Bissau for both legs of the tie despite a four-match ban for "offensive language and insults toward the referee" in Zambia four months ago. The suspension applies to Cup of Nations qualifiers, but not World Cup qualifying ties. The 13 winners of the two-legged preliminary round ties advance to the second round, where they will be joined by the 27 seeded countries. The teams have already been drawn into ties, which will be played on a home-and-away basis. The 20 winners advance to the group phase, where they will be drawn into five pools of four teams each, with the group winners advancing to the finals in Russia.